First, let’s talk specs. 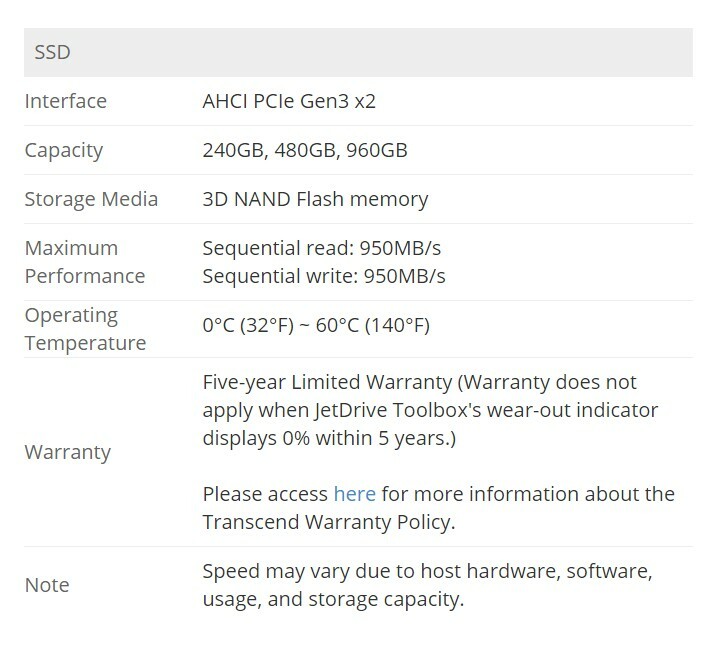 The Transcend JetDrive 820 is made with the latest 3D NAND flash technology and is offered in capacities of up to 960GB. Its read and write speeds can reach up to 950MB/s. It is faster than any SATA 3-based SSDs out there. At the top side, you can see that there is a Nanya DRAM chip and a bank of NAND flash chips. The package includes two screwdrivers – one with a P5 bit and another with a T5 bit. That means you don’t need to own any sort of special screwdriver set to open up the machine. However, as Transcend has stated, upgrading a Mac Pro or Mac mini requires additional screwdrivers. Though, you can purchase them separately on the Transcend website. The JetDrive 820 is a straight swap for the original. JetDrive Toolbox software[/font][/size]They developed their own tailor-made software to let you monitor the SSD’s health, enable TRIM, and even upgrade its firmware. You had better to install the JetDrive Toolbox software because you need to enable TRIM. The only way you can enable TRIM is through this software. This is to prolong your SSD’s life span. There are two ways to do the migration – either by creating a full carbon copy image to an external storage device with SuperDuper! and restore it after the SSDs have been swapped, or through Time Machine. The data cloning process might take a couple of hours, but the actual installation should take less than half an hour. You want to do the installation in a clean place with enough free time without distractions to complete the process end-to-end. Although SSD is expensive, the performance is spectacular – especially since Apple has incorporated PCI Express (PCIe)-based flash storage in newer models. I am happy that Transcend is offering an alternative to the market and it works great on my MacBook Air.